Intense wafts of pineapple, grapefruit, lemon, malt and big hops on the pour. Not often I say this about the aromas given off beer as for me as taste is king, but this smells great ! 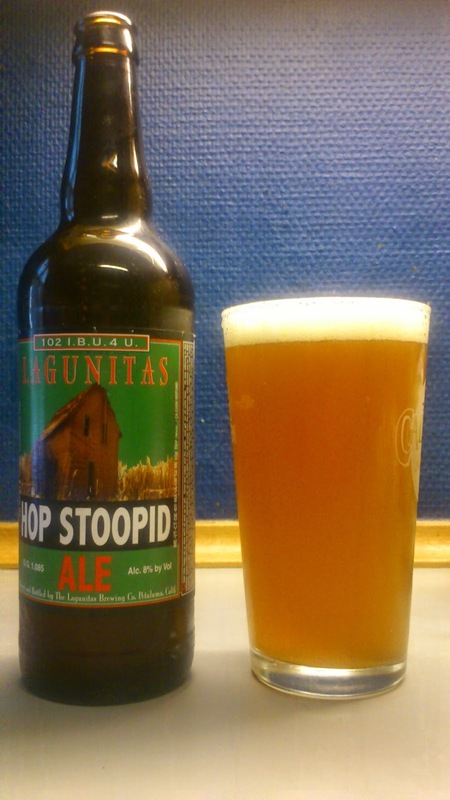 Hop Stoopid pours amber dark gold with a fluffy white head. Pine, grapefruit, caramel malt and very hoppy on the intake while the finish is moderately bitter and sweet. Malty long lasting sweet and dry aftertaste. Despite the strength no alcohol shines through. This has quite a smooth oily mouthfeeel. I was expecting this one to give me a hop burn right down to the pit of my stomach but that never happened nor would I describe this as a refreshing IPA as it is too full bodied. Absolutely nothing to be undecided about here unlike the Sawtooth Ale in the last post, this is a luscious IPA. It is styled a Double IPA but I'm not snooty enough to get into small details like that so IPA it is. I have no problems whatsoever buying or drinking this again, preferably locked in a room, alone, within my own inner sanctum of tranquility without the distractions of the internets...the botnets are after me, bastards. To borrow a phrase again, buy it and try it. Everything considered in a serious manner for once, this scored 10/10 on the *insert anyone here* 'Are you going to share this bottle ? '..*me* 'Are you mad ? ' Beerometer.